Today there was a great article in Midwest Wine Press about the Illinois Grape Growers and Vintners Association rebranding their logo and advertising campaign. This is the best example I have seen in a long time. The logo is fun, colorful and creative. 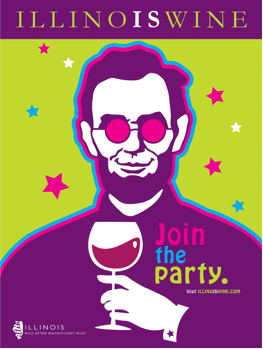 How can you go wrong with Abe Lincoln wearing shades and holding a wine glass? Congratulations Illinois! Is it time for your winery to take a look at your logo and image? If it is dated, tired and hard to read, it might be time for a fresh look. You may say, well my customers like our logo. Then I would ask, do you need to increase business? With a new updated look, you may attract new customers. I bet this new Illinois campaign is going to attract new wine drinkers and give a boost to their industry. A good pace to start is look at your target market, and no, everyone can’t be your target market. Determine who is and who will buy your products and services. Interview people who drink wine (not existing customers though because you want people who are not yet biased about your business). How do you do that? Strike up conversations where ever you go and ask questions; ballgames, elevators, waiting rooms, grocery lines. What words and phrases do they use to describe their wants and needs. You are looking for a particular demographic that is searching for what you have to offer. This “look and feel” or brand essence then needs to be portrayed in the logo and through out all marketing messages. Find a designer to create the new look. There are affordable, professional design companies who can assist in the development of your logo. There is probably one in your community who of pride to work on a local . Research their portfolio of past clients to make sure they do professional work. Do not use a family member unless they are trained as a graphic designer. To be successful in today’s market, you must have a professional design. Get started today. Happy re-branding!